Your massage will be tailored at each visit to suit your personal needs. I work with men and women, children and seniors, very active athletes and people who may be frail from illness or injury. I specialise in massage to treat problems people may have from posture, work, sports, stress, illness, injuries or just everyday life. I often work with people in pain from a variety of issues and can offer advice and support in addition to massage to make you more comfortable. Your first appointment begins with a brief consultation to tell me how you are feeling and what you hope your appointment will accomplish. We will discuss any problems you may have and I will ask some questions about your medical history. This information is kept on a secure server. At each appointment we will briefly discuss what you’d like from your massage, and I will then tailor the treatment to suit YOU. Many massage treatments combine a bit of work on tense or uncomfortable areas combined with relaxation. Relaxing Massage – Just as it says! Pressure is to your preference, from gentle to firmer deep tissue. 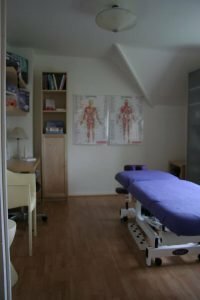 Remedial Massage – Treating a variety of problems with advanced massage and soft tissue techniques, which may include advising on exercises, home care, information about pain, or referring onto other professionals. Sports Massage – Injury prevention and recovery, and maintenance for peak performance. You don’t have to choose! Techniques will be ‘mixed and matched’ to suit you. Massage is safe and helpful for most people, but some conditions require adapting the treatment. It is therefore possible that I will ask you to check with your doctor if massage is suitable for you, so please let me know when you book your appointment if you have any medical conditions. You do not need to know anything about massage to plan your treatment. Most people want a combination of some relaxation and having some problem areas worked on, but each treatment will be tailored to you and I will mix and match techniques to suit. I will suggest a general plan for the massage and once we have agreed and I have answered any questions you might have, I will leave you to prepare. Usually you will undress down to your underwear and lie on a comfortable massage table with a supporting head rest and arm rest. You will be covered throughout the treatment, to keep warm and protect your modesty. However you are not required to undress, and if you prefer to leave any amount of clothing on I can work with you that way, too. During the massage, you will be encouraged to let me know how you are feeling and if there is any discomfort, but most of the time you will be relaxing quietly and with soothing music in the background (unless you choose otherwise). If there is anything at all you don’t like I can change it – there are so many different techniques and styles for me to chose from to make your experience the best possible. Afterwards I will often be able to suggest specific exercises and stretches and home care advice if you would like. You will be left to take your time dressing in private after your treatment. At subsequent appointments you will let me know if there have been any changes since I saw you last and how you are feeling before we begin the massage. This may be different from the last treatment depending on what you want each time and your physical condition. This is your massage and you should enjoy it! Also known as Hot Stone Massage, warm, smooth stones are massaged over your muscles causing them to release tension and inducing a deep state of relaxation. 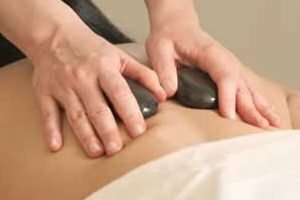 Sometimes people also enjoy having cold stones alternated and used very briefly to provide stimulation to the circulation and nervous system, but this is of course your choice. This treatment can be just for relaxation or be part of a remedial or sports treatment. I also use my hands to massage after the muscles are warmed, and if you prefer a deep tissue treatment the warmth quickly prepares you for the deeper pressure. However as always the depth and pressure of the treatment is your choice. You may have a full body treatment for 75 minutes, even more massage with 90 minutes, or just have your back or legs done for 45 minutes. However please allow a little extra time for your appointment. People are often so relaxed they need a few minutes to ‘wake up’ before leaving. This luxury treatment is fantastically relaxing and leaves your skin glowing. Beginning with exfoliation and ending with a relaxing massage, the perfect way to unwind, and great for reviving dull skin. First, an Exfoliation Scrub is gently applied while you lie on the massage table. The scrub is removed using warm cloths and your skin is buffed dry. Finally, a full Body Massage applies moisturising oil for your skin to soak up and also works out muscle tension. You decide on deeper work for your muscles or a more gentle massage just to relax. Choose from one and ¼ hour or have even more massage with a one and ½ hour treatment. Please allow for an extra 20 minutes or so to relax and recover afterwards before you leave. Shorter 45 minute appointments are available for just your legs or back. This very relaxing treatment is done with you sitting up in a regular chair and I work over your clothing, so no disrobing is required. This is an ideal treatment to work out upper body tension and is convenient for you with the shorter treatment time and since you do not have to undress. This treatment is 30 minutes, and the massage covers your upper back, arms, neck, shoulders, head and face. As always, the treatment is customized to you, and if you prefer, there can be a focus on any problem areas. Oils are not used on your skin, but you may choose to have oils on your scalp to moisturise your skin and hair. If you would like me to visit your office or home this treatment is ideal, and can take as little as 10 minutes per person up to 45 minutes for each treatment. Please contact me to discuss on-site visits. There is normally a 3 hour minimum, although some exceptions may be made. Address details are sent upon booking. To check availability or book an appointment, please check the Online Booking Calendar. On-site Chair Massage is idea for work breaks and wellness, events and parties. Indian Head & Shoulder Massage can also be offered or more traditional massage using oils and lying down on a massage table. Please contact me for details or a quote. My experience as a sports and remedial massage therapist carries over into the office. Extremely effective treatments can be done using the supportive and very comfortable massage chair and working over your clothing. Many conditions can be successfully addressed, such as stress, neck and back pain, frozen shoulder, tennis elbow – and much more. Treatments are tailored to your needs on the day. These can be regular or occasional. Regular visits can be weekly, monthly or otherwise to suit. You may begin by having a few trial visits to see how this can help your work environment. Treatment time can vary considerably depending upon your needs, anywhere from 10 to 45 minutes. Many workplaces find offering 15, 20 and/or 30 minute treatments effective and efficient. Some employers allow employees to take time during the day for their appointments while others find it more useful for employees to visit during breaks, lunch, or before or after their work begins. Payment options are varied; sometimes employers pay the full cost, or subsidise the treatments partially, or the employee pays themselves with the employer offering space. There are many options to consider and the best way to begin is by contacting me so we can discuss your needs. If you have never received a professional massage, you are in for a treat! Most people find massage physically very enjoyable, with a depth of pressure YOU find comfortable, it can be extremely relaxing and restful. At the very least, some quality ‘me’ time to refresh yourself. Massage is helpful for recovery from many injuries and can provide comfort and relief and therefore a better quality of life to people with many chronic health conditions. Treatment often needs to be adjusted for injuries, illnesses and diseases so please let me know when booking if you currently have any medical issues. It may be appropriate to check with your doctor to see if massage is suitable and this is something we can discuss. If you are uncertain about trying massage please contact me for an informal chat about your situation. Please note if you are currently unwell with a bad cold, fever or infection of any kind a massage will make you feel worse, and so your treatment should be postponed. I also do not want to catch it, or pass it along to other clients! You can be sure the treatment room is hygienically clean and safe for you.